The Securities Enforcement Empirical Database (SEED) currently provides data for SEC actions initiated against public companies traded on major U.S. exchanges and their subsidiaries. We define public companies as companies with security prices that are tracked by the Center for Research in Security Prices. 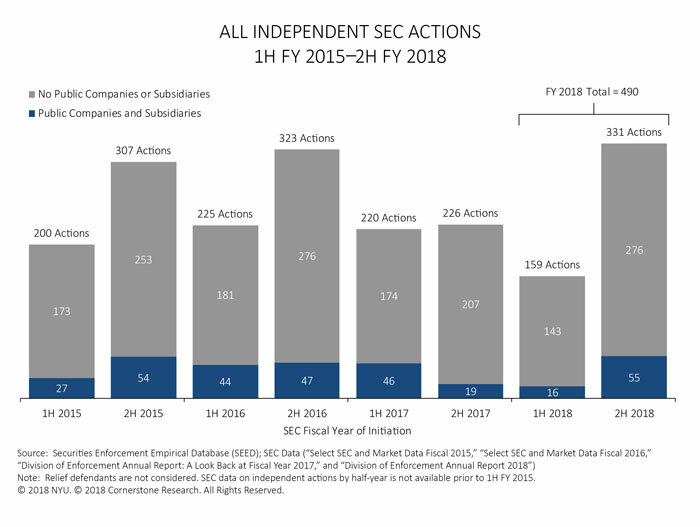 The total number of independent SEC actions more than doubled from the first half of FY 2018 (159 actions) to 2H FY 2018 (331 actions). The public company and subsidiary actions tracked by SEED accounted for 14 percent of the FY 2018 total. ALT = The figure illustrates a comparison between the number of SEC actions against public companies and subsidiaries and the number of SEC actions against defendants other than public companies or subsidiaries in each half of fiscal years 2015 to 2018. See table for data. See color accessible chart. 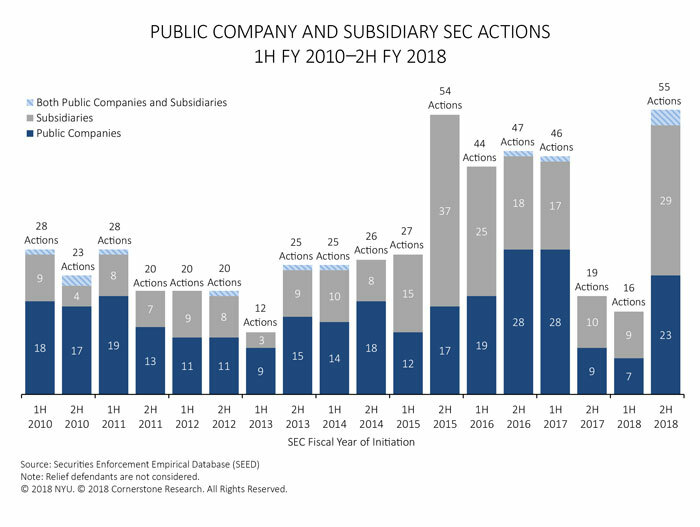 Reversing a downward trend that began in 2H FY 2017, the SEC filed 55 new enforcement actions against public companies and subsidiaries in 2H FY 2018—the most actions in any half-year covered by SEED. The increased activity near the end of the fiscal year brought the FY 2018 total to 71 actions, a 9 percent increase from FY 2017. ALT = The figure illustrates the number of SEC actions against public companies and subsidiaries in each half of fiscal years 2010 to 2018. See table for data. See color accessible chart. 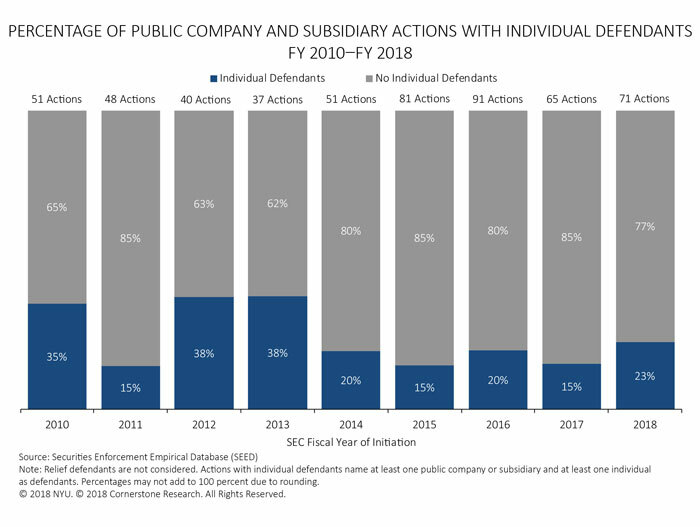 In FY 2018, 23 percent of public company and subsidiary actions also named individuals as defendants, consistent with the FY 2010–FY 2017 average. 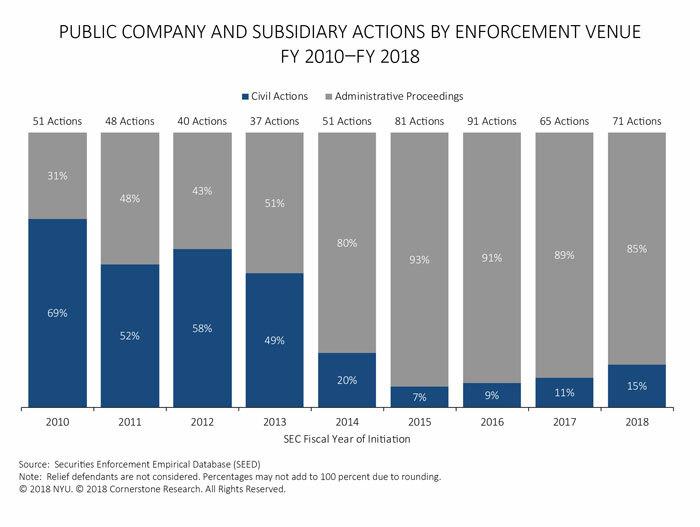 ALT = The figure illustrates the percentages of SEC actions against public companies and subsidiaries with vs. without individual defendants for each fiscal year from 2010 to 2018. See table for data. See color accessible chart. The SEC continued to bring the substantial majority (85 percent) of actions against public companies and subsidiaries as administrative proceedings in FY 2018. In contrast, 55 percent of actions without public companies or subsidiaries were filed as civil actions in FY 2018. ALT = The figure illustrates the percentages of civil actions and administrative proceedings against public companies and subsidiaries for each fiscal year from 2010 to 2018. See table for data. See color accessible chart. SEED tracks the type of allegation the SEC makes in each enforcement proceeding. Almost half (45 percent) of public company and subsidiary actions in FY 2018 involved Broker Dealer or Investment Advisor/Investment Company allegations. ALT = The figure contains a heat map of the percentages of SEC actions against public companies and subsidiaries for each allegation type from fiscal year 2010 to fiscal year 2018. See table for data. See color accessible chart. SEED classifies public companies and parent companies of subsidiaries by Standard Industrial Classification (SIC) code. More than half (51 percent) of public company and subsidiary actions with public company and subsidiary actions in FY 2018 targeted the Finance, Insurance, and Real Estate industry. 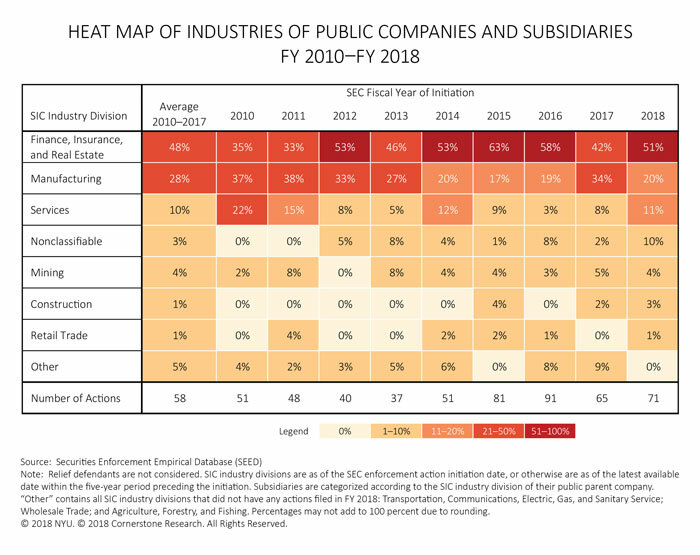 ALT = The figure contains a heat map of the percentages of SEC actions against public companies and subsidiaries for each SIC industry division from fiscal year 2010 to fiscal year 2018. See table for data. See color accessible chart. 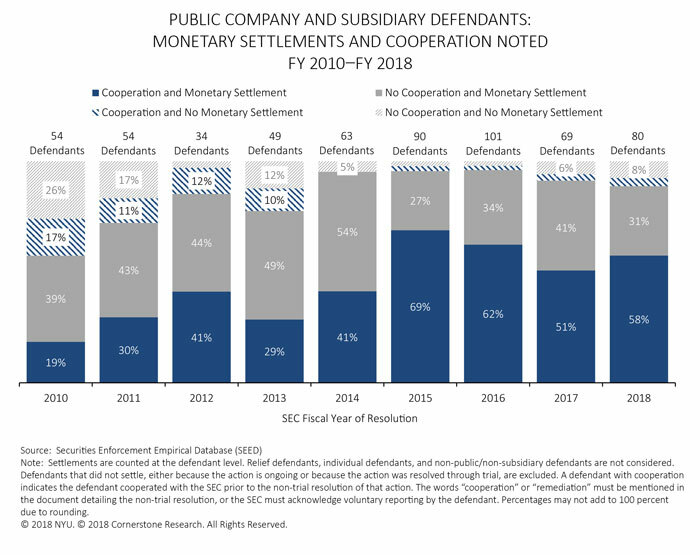 For the fourth consecutive fiscal year, more than half (61 percent) of FY 2018 settlements with public company and subsidiary defendants noted some form of cooperation with the SEC. 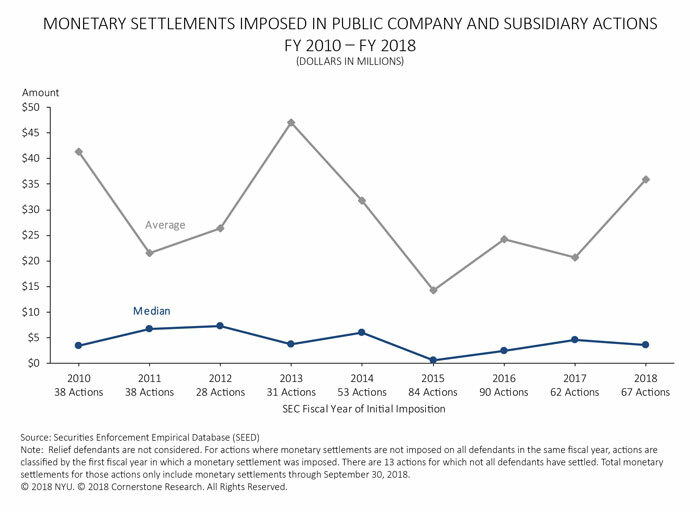 The SEC imposed monetary penalties on 89 percent of public company and subsidiary defendants that reached settlements in FY 2018, consistent with the FY 2010–FY 2017 average (84 percent). ALT = The figure illustrates, for each fiscal year from 2010 to 2018, the percentages of SEC actions against public companies and subsidiaries that noted: cooperation and monetary settlement; cooperation and no monetary settlement; no cooperation and monetary settlement; no cooperation and no monetary settlement. See table for data. See color accessible chart. Monetary settlements in public company and subsidiary actions totaled over $2.4 billion in FY 2018—more than the total in any fiscal year since at least FY 2010. This total was driven by a $1.8 billion settlement in a single action against a public company; however, the amount paid in the action will be offset by related settlement payments not made to the SEC. The average monetary settlement in FY 2018 ($36 million) was higher than the average over the prior four fiscal years. ALT = The figure illustrates the variations of the average monetary settlement and of the median settlement from fiscal year 2010 to fiscal year 2018. See table for data. See color accessible chart.